Well, I am here to answer these questions and others. I keep two spray bottles of white distilled vinegar in my cabinet. The first is full-strength vinegar, and the other is 50 percent white vinegar and 50 percent water. These two spray bottles take care of most of my cleaning needs. One of the most popular uses for any vinegar is to make salad dressing. Moreover, for some of you, that is the extent of your use of this great ingredient. In this article, I am going to show you many more uses for white distilled vinegar. We don’t need the expensive fancy vinegar for these tips, save those for the salad dressing and use the plain white distilled vinegar here. In my opinion, distilled white vinegar is by far the best home remedy for cleaning. We are going to show you to clean all things with it. It cuts grease, disinfects the surface, and deodorizes without leaving any harmful chemical residues. You can even learn how to make vinegar yourself so that you always have an ample supply on hand. Vinegar marinades tenderize the meat while killing any surface bacteria. Build a flavorful marinade by adding your favorite herbs and spices to white vinegar, sherry vinegar, white balsamic vinegar, or red wine vinegar. Use 1/4 cup of marinade for every 2 pounds of meat and marinade for a minimum of 20 minutes, or you can leave it in the refrigerator for up to a day depending on the meat chosen and how flavorful you want your meat. Try a traditional balsamic vinegar or white wine vinegar with chicken. 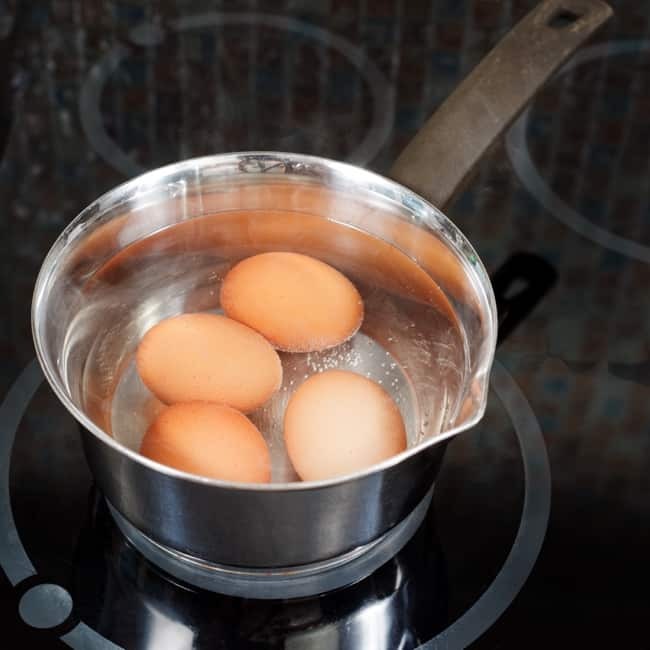 Add a tablespoon of distilled white vinegar to the boiling water when making eggs. The vinegar keeps the eggs together as they cook and prevents the mess created by cracked eggs. It also helps the eggs shell easily when you are ready to use them. When you get down to the end of the jar of mayonnaise, mustard, catsup, or salad dressing clinging to the jar, add a few drops of white vinegar, apple cider vinegar, or wine vinegar and shake. The remaining condiments are slightly diluted and able to be poured out. Mix up a vinegar solution to use for washing fresh fruits and vegetables. The vinegar dissolves wax that may be coating the surface and removes pesticide residues. Rinse the vegetables and fruits thoroughly with warm water. Soak a clean cloth in vinegar and use it to wrap your cheese. The vinegar-soaked cloth keeps the cheese from drying out and prevents mold from growing on the surface. Once wrapped, place the cheese in an airtight container and refrigerate. Have you ever wondered why Easter Egg Dye instructions always include adding a teaspoon of vinegar to the water? The vinegar brightens the dye color and prevents it from streaking. When using natural dyes or chemical dyes, add a teaspoon of vinegar to every 1/2 cup of hot water or dye mix. For a sore throat caused by coughs and colds, gargle with a glass of warm water with a tablespoon of white vinegar or apple cider vinegar and a teaspoon of salt added. Use as often as needed until your sore throat is gone. Once a week, give your teeth a brush with a toothbrush dipped in distilled white vinegar. Rinse your mouth thoroughly after brushing. Brushing with vinegar will keep your teeth white and destroy the bacteria that cause bad breath. For a relaxing spa treatment at home, add our Skin Softening Bath Additive to your bath water and enjoy a soak. The vinegar removes excess oils and dead skin, leaving your skin soft and smooth. Before applying nail polish, I clean my nails with a cotton ball dipped in distilled white vinegar. The vinegar cleans away residual oils. It helps my manicure last longer and reduces chipping. 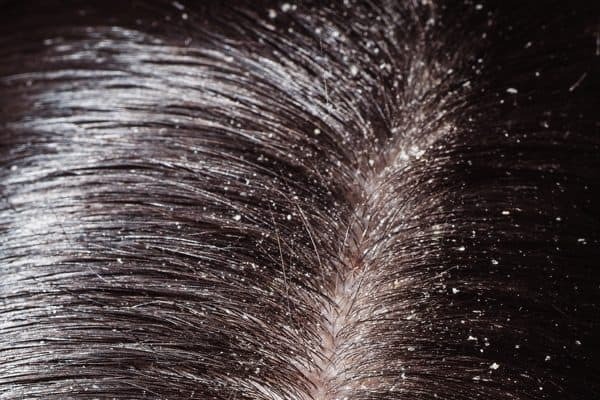 White vinegar is a quick and effective home remedy for a dry, flaky scalp. Once a week, pour a cup of white vinegar over your scalp and wait 15 minutes. Rinse it out with cool water. Your hair will shine again and don’t forget to clean your hair brushes with vinegar (of course) while you at it. The disinfecting ability of white vinegar can be used in a foot bath. Soak your feet in a water diluted solution of vinegar for a couple of minutes, and it will help fight foot fungus and toenail fungus. Are your feet in need of repair before you don those summer sandals? Soften them up by soaking them in one part vinegar and two parts warm water. The vinegar softens up the skin and removes dead skin. Follow up with a good buffing. Rinse your hair with a tablespoon of vinegar added to your rinse water once a month to remove build up of hair products. Your hair will be cleaner and brighter. Soak your loofah in vinegar and water overnight to remove soap residue and disinfect it. Rinse it thoroughly and hang it to dry. A dab of white vinegar on mosquito bites and insect stings stops the sting and itch while it disinfects the area and helps them heal. 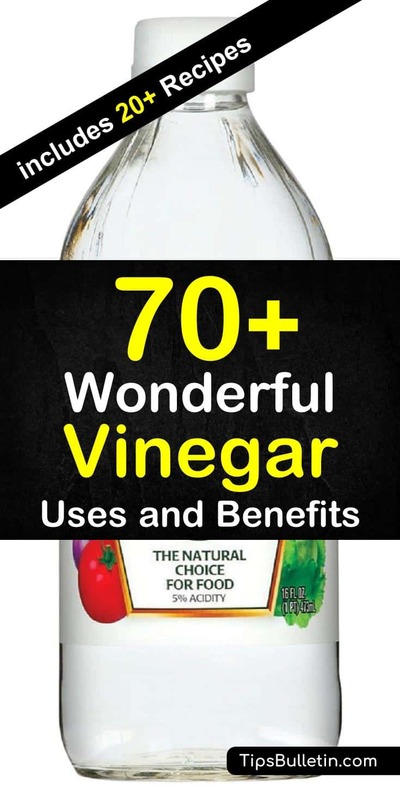 Its disinfecting nature is a huge benefit of white vinegar. It is one of the best natural pest control remedies, but so often it seems to be forgotten. Using vinegar in the garden especially to kill weeds around pathways, shows you what powerful home remedy you have sitting in your cabinet. Make your own homemade weed killer with plain vinegar and spray a mixture of vinegar and dish soap directly on the weed. If you need an even stronger weed blocker add 1 tablespoon of epsom salt to the mix. Pour it in the cracks and around the sidewalk and driveway. 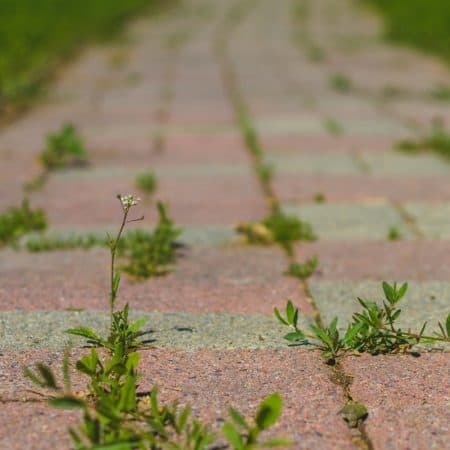 It kills weeds and prevents unwanted plants from growing in the cracks. Give each weed plenty of vinegar so that it will reach the roots and kill the entire plant. White vinegar is the base of a simple homemade all-purpose cleaner to wipe all your metal and plastic garden and patio furniture. Right, when we are getting ready for the new outdoor season, we use it a lot during spring cleaning. Find cleaner recipes to clean all your patio and outdoor furniture here. Vinegar works extremely well as a spider repellent. Just mix one cup of white vinegar and two cups of warm water in a spray bottle. Spray it around doorways or window frames, and it will keep the spiders away. It also works as a natural repellent for mosquitoes and smaller insects like ants. Perfect for a bug-free home. Cut flowers can become droopy quickly. By using our flower preserving recipe in the vase instead of plain water, your cut flowers will last longer. If flowers are already droopy, it will give them new vigor. I’ve used the chemical oven cleaners several times in my life and each time left me gasping for breath. I don’t want those chemicals in my house ever again. Thankfully, my oven now has a self-cleaning setting, but it takes all day to clean and really heats up the kitchen. So, I was determined to clean my oven with vinegar. 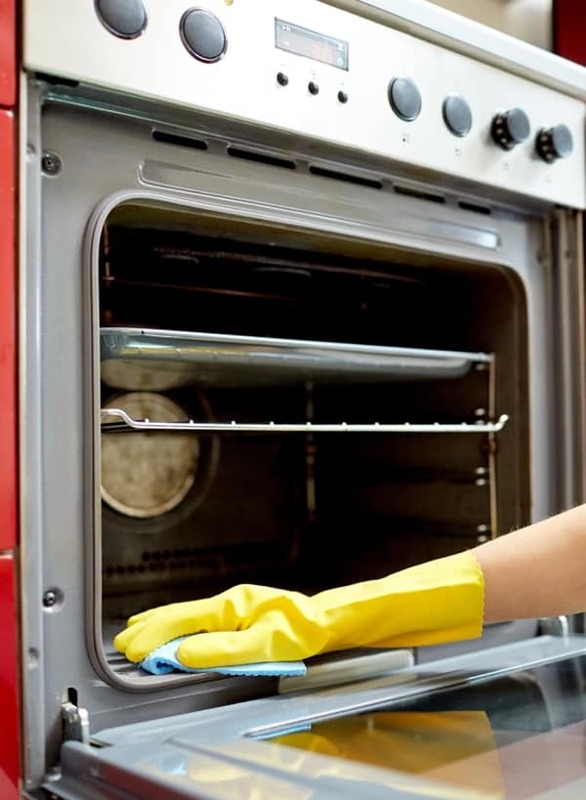 Once you know how to clean an oven, it works well although it does require a little time and elbow grease. Start with an empty oven. Remove the racks, along with anything else that might be there. In a small bowl, I mixed a cup of baking soda with a few tablespoons of water, just enough to make a thick baking soda paste. Spread this past all over the inside of the oven, covering it completely with baking soda, but avoiding the heating elements. Wear gloves and use a scrubby cloth to rub the paste into all the gunk. Then close the oven and leave it alone overnight. While it sits, I clean the racks as well. The next day, wipe out the baking soda paste and use a plastic spatula to scrape up the gunk. Then spray the entire oven surface, except the heating elements, with vinegar. The whole foam up and let it work for 15 to 20 minutes. Then wipe up the entire mess and admire the clean oven. It only stays clean for a short while, so I may as well enjoy it. I put the racks back, and we are ready to start cooking. I use a solution of half white vinegar and half water to clean the interior of the fridge. A quick spray and wipe down removes odors, cleans the interior, and kills off mildew and mold spores and germs that might be lurking. Don’t forget to clean the gasket and the vegetable bins. When you finish, clean the top of the refrigerator with the same solution. A mixture of vinegar and baking soda gently removes coffee and tea stains from your ceramic and porcelain cups and mugs. The baking soda helps get the vinegar into tiny cracks and crevices that tend to harbor stains while providing a mild abrasive action. To remove coffee stains from clothes mix one tablespoon of warm water, white vinegar, and laundry detergent. This powerful cleaning solution will get rid of coffee stains on your shirt quickly and efficiently. I like to use vinegar to clean the stains and odors from plastic food containers, but also effectively cleans plastic toys and other items. Spray the items with vinegar, wait a minute, and wipe it down with a clean cloth. It is a huge benefit that it cleans and disinfects without any harmful chemicals. For bathroom cleaning, I like to use a mixture of equal parts of full strength white vinegar and hydrogen peroxide. I spray this DIY bathroom cleaner around the sink, toilet seat and housing, and the tub with white vinegar; then spray everything again with peroxide. The mixture of white vinegar and peroxide is a more powerful germ killer than either one alone. Let them mix for a minute while I clean the mirror and do other cleaning chores, then wipe the surfaces down with a damp cloth. Pour a cup of white vinegar into the toilet and let it sit for several hours or overnight. It dissolves hard water stains and cleans the bowl. Scrub the toilet with a toilet brush before flushing. For even better results mix the vinegar with borax and essential oils to get an even more powerful homemade toilet bowl cleaner. White vinegar gently removes stains on clothing caused by antiperspirants and even light scorch marks from ironing. Apply white vinegar on a soft cloth and gently rub the stain. Try it on other stains as well. 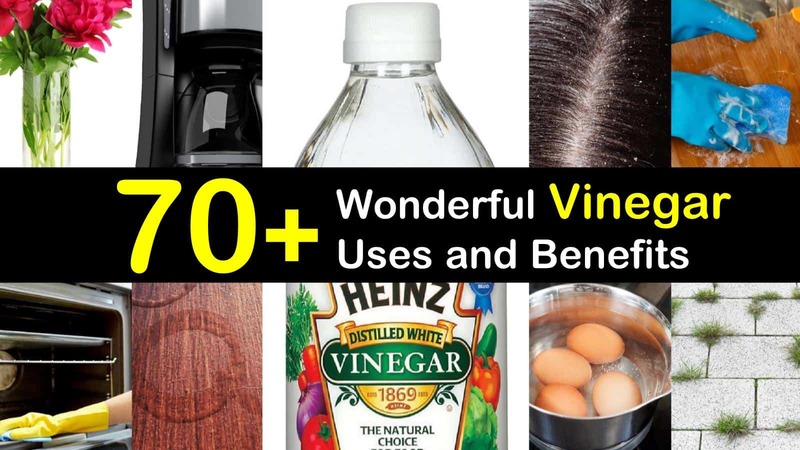 Vinegar is a powerful carpet cleaner. Mix 1/4 cup of baking soda with 2 tablespoons of white vinegar. Rub the stain with the paste and let it dry. Vacuum the next day to remove the baking soda and the stain. For tougher stains e.g. hair dye on carpet or blood stains, use our special homemade carpet spot cleaner or carpet blood stain cleaner recipe and follow the same procedure. Test either method on an out of the way spot of carpet first to make sure your carpet is color-fast. Place paint brushes in a pot of vinegar and let them soak for an hour or more. Then turn the heat on and bring the vinegar to a simmer. Drain the vinegar and rinse the brushes clean. Clean your faucets with vinegar. Give them a spray and allow to soak for a minute before buffing them clean with a soft cloth. For tough, hard water stains, use my Vinegar Abrasive Paste. Rub the mixture on the stains with a cloth, then rinse and buff dry. Showerheads tend to get lime buildup in the holes that can eventually affect the use of the shower. Clean a shower head by placing 1/2 a cup of vinegar in a plastic sandwich bag. Place the bag of vinegar solution over the showerhead and secure it in place with a piece of painter’s tape. Leave the vinegar in place overnight, then remove it and scrub off any remaining lime buildup. Vinegar serves as an excellent homemade descaling solution. In addition, use white vinegar as a natural ingredient to make a very powerful DIY shower cleaning solution. Keeps your bathroom clean and is a super cheap to make power cleaner. Using vinegar in the laundry is an inexpensive way to boost your detergent. Add 1/2 cup of distilled white vinegar along with the laundry detergent when washing clothes. The vinegar reduces static cling and helps the clothes wash cleaner. When washing dark clothes mix 1/2 cup of vinegar into the final wash cycle to clean up any soapy water. If you need to stretch or unshrink wool socks or other laundry made of animal fibers, mix two tablespoons of vinegar and one quart of water. Let the garment soak. More on how to unshrink clothes here. Add 1 cup of distilled vinegar to a large pot of water. Bring the solution to a boil, remove it from the heat, and add your baby or sweaty clothes. While they soak overnight, the stains and odors are removed. Throw them in the wash and launder as usual. They come out fresh and bright. It is a wonderful and natural way to wash baby clothes. Wipe down scuffed leather shoes or handbags with a cloth soaked in white vinegar. They will get clean and shine up nicely. Same goes for cleaning stains on suede shoes, if the shoes need it, I give them a swipe inside as well to get rid of odors. When ice storms threaten, coat your car windows with a solution of three parts distilled vinegar and one part water. The acidity prevents the window from icing and saves you a lot of work scraping the windows. I easily clean my microwave with equal parts of hot water and vinegar. Place the mixture in a small bowl and microwave it for 5 minutes. The steam loosens any dried on mess and makes it easy for me to wipe it away. Worn CDs and DVDs that skip or freeze can sometimes be revived by cleaning it with distilled white vinegar. Spray the disc with vinegar then wipe it dry with a clean, soft cloth. Make sure it is completely dry before playing it again. Get rid of that unwelcome litter box odor by cleaning it with distilled white vinegar. Empty the litter box and add 1/2 inch of vinegar to cover the bottom. Let it stand for a half hour, then rinse it with cold water. Chewing gum stuck to hair or fabric is a terrible mess. I was so happy to learn this trick on how to remove gum from clothes. Pour a little vinegar in a cup and warm it in the microwave. Saturate the gum with the vinegar to dissolve it and allow it to be easily removed. That gummy glue left behind by labels and price tags comes off easily with an application of vinegar. Soak the paper through with vinegar and let it sit for a few minutes. Give it a good wipe to remove the glue without scraping. Melted candle wax on furniture or carpets comes off without too much fuss with a cloth dipped in equal parts of vinegar and water. Start by softening excess wax with a blow-dryer set on high. Soak up the melted wax with paper towels. Then wipe the remaining spot gently to remove the wax without driving it deeper into the carpet. Vinegar is one of the easiest methods of getting wax out of carpet effortlessly. Crayons are made of wax and will dissolve in white vinegar. I use a small brush or toothbrush dipped in white vinegar to scrub the crayon marks, then wipe the stains away with a soft cloth. Wipe the entire floor with a simple vinegar floor cleaner and everything will shine again. You can save a lot by using vinegar instead of expensive deodorizers. Simply spray your furniture, carpets, dog beds, and other fabrics with a fine mist of distilled white vinegar. The vinegar neutralizes odors and freshens up the room. Wipe down sticky scissor blades with a cloth dipped in white vinegar. Soap and water encourage rusting that ruins the blades. Vinegar removes the gummy mess without harming the blades. Remove soap and food residues in the dishwasher by pouring a cup of vinegar into the empty dishwasher and running it through a full cycle. Repeat this once a month to keep your dishwasher clean, reduce hard water buildup, and disinfect it. 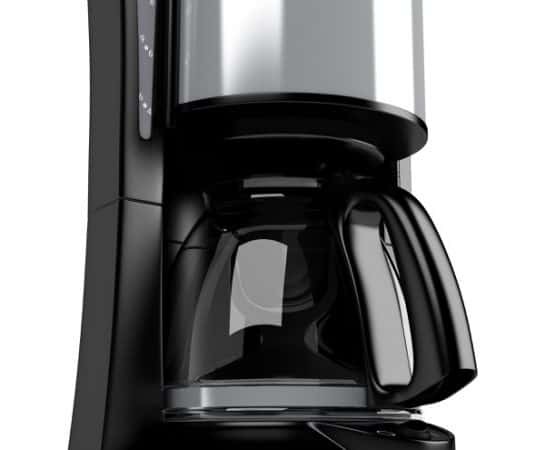 Reduce hard water buildup to disinfect and clean a coffee pot at the same time by cleaning the coffee pot with vinegar. Drain all water from the system, then fill it with vinegar and run a full cycle. Follow the vinegar wash with a rinse water cycle before making coffee again. Remove the odor and pet urine stains by blotting the stained area with a cloth soaked in 1/4 cup of vinegar diluted with a quart of water. Blot the mess repeatedly until the spot and odor are removed. Let it dry, then test for a smell. If you detect any odor, repeat the process. The trick here is that you cannot allow the stain to soak into the foam padding of carpet or furniture. Once the foam is soaked, the odor is nearly impossible to get out. To remove food stains from upholstery or a mattress, just mix a quarter cup of laundry detergent, a quarter cup of vinegar with two cups of water in a spray bottle. Spray this homemade mattress cleaner very lightly on your mattress and let it sit for half an hour. Using a towel just blot the are until all food stains are gone. After vacuuming the mattress will be fully cleaned and stain free. Greasy clogs can ruin your day, but vinegar can help unclog a drain or kitchen sink quickly. Remove the water from the sink and pour 1 cup of baking soda down the drain. Follow the baking soda with 1 cup of vinegar. Give it 10 minutes or more to foam and work on the pipes, then pour a pot of boiling water down the drain. Make sure you check out our natural drain cleaner recipes for more details. The combination of using baking soda, vinegar, and heat should clear greasy clogs and open the drain without the caustic chemicals we normally use. White vinegar gets rid of any mineral deposits in the steam cleaning holes along the iron plate. Its grease and grime dissolvent ability make vinegar the perfect way to clean an iron. Just mix one cup of distilled water with one cup of white vinegar and fill it in your steam iron. Using this mixture in the steaming position will free up any clogged holes and clean the base plate of the iron naturally. I used to clean my grill by burning off the food residues, but I always forgot to turn off the grill after 5 minutes and ended up using all of my gas. This method works for charcoal and gas grills. It removes charcoal residue, burned on food, and grease buildup on the grill before each use. Spray the grate with distilled white vinegar, then scrub it with a wire brush or balled up aluminum foil. Spray your dog with our “Dog Shine” recipe to combat dog odors while helping to repel fleas and ticks. I like to use this recipe for a deodorizing between baths. I prefer to use cedarwood essential oil, but lavender, rose, eucalyptus, patchouli, and lemon verbena are also effective for repelling fleas and ticks. I use vinegar to clean my computer and electronic peripherals. I start by turning everything off and unplugging them; then I run the vacuum over them to remove dust and crumbs. I dilute some white vinegar with an equal amount of water and use it to dampen a clean cloth. Squeeze the cloth out until it is almost dry. 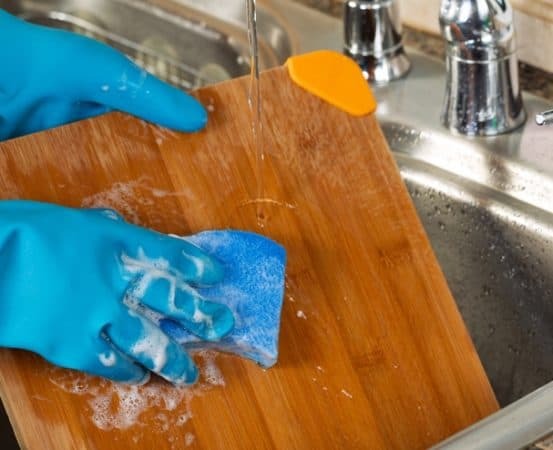 Wipe down and clean your computer screen and cases with the vinegar-soaked cloth. Use cotton swabs in tight spaces. Remove the tracking ball from your computer mouse and clean it with your vinegar-dampened cloth. Clean inside the mouse with a cotton swab dampened with the vinegar solution. Let all parts dry thoroughly before reassembling. Somehow, we seem to get ballpoint ink on everything: clothes, furniture, and even walls. Full-strength white vinegar is the cleaner of choice here. I scrub the spot with vinegar on a cloth or sponge, rubbing gently until all the ink is gone. Our very simple homemade window cleaner recipe is perfect for super-clean strike free windows. Just mix vinegar, dish detergent and water in your bucket and let it’s do its magic. I do also fill an old spray bottle with it, makes it so much handier to clean only a single window, our car windows or car carpet. Clean window blinds easily with a solution of half vinegar and half warm water. I drip a sponge or microfiber cloth in the solution, wring it out, and start wiping. You’ll collect a lot of dirt and dust as you go, so keep rinsing the sponge in a bucket of clean water. Make sure you get both sides clean. Clean your piano keys with a dilute vinegar solution. Mix 1/2 cup of white vinegar with 2 cups of water. Dip in a sponge and squeeze it dry, then wipe down the piano keys. Leave the keyboard open to dry thoroughly. If someone forgets to use a coaster, you can end up with those ugly white rings on the furniture. 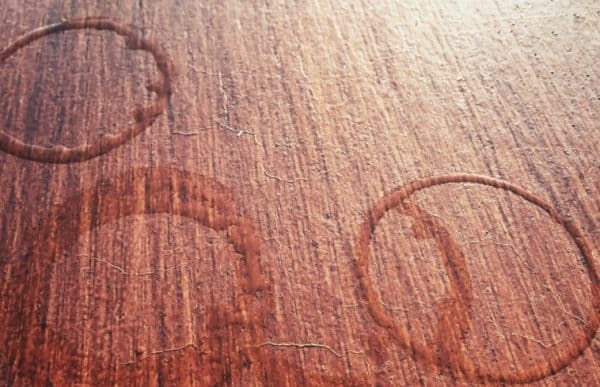 I remove old water stains from wood with my wood ring cleaner. Mix it thoroughly, then dip a soft cloth into the mixture. Rub the rings in the direction of the wood grain. When you have them rubbed out, buff the surface with a clean, dry cloth. Clean leather with a sponge dipped in full-strength white vinegar. It will get off most stains without damaging the leather. Dry the spot with a soft, dry cloth. Read more about how to clean leather including some simple homemade leather cleaner recipes here. I recommend that you test an out of sight spot before cleaning your leather, just to make sure it is color-fast. If your favorite leather chair has lost its luster, I have the solution. Mix equal parts of white vinegar and boiled linseed oil in a spray bottle. Shake it well and give the chair a spray. Buff it on evenly with a soft, dry cloth, removing the extra oil and vinegar. Rugs and carpets that are matted and worn from too much traffic can get new life with a good brushing. I mix 1 cup of white vinegar and 1 gallon of warm water in my mop bucket. Then I dip my broom into the vinegar water and brush the carpet. The carpet nap will stand up again, and the colors are brightened. There is no need to rinse. If you need a slightly stronger carpet refresher, You can go even further and make your own DIY carpet shampoo based on vinegar. You can make quick work of removing the soot and dirt that collects on brick and stone fireplaces. Just make a solution of 1/2 gallon of warm water and 1/2 cup of white vinegar. Dip a large sponge into the mix and wipe down the bricks or stone. This solution will also work to clean brick flooring. Do not use it on marble and similar stone products. To be safe, check with your manufacturer and test it on an inconspicuous spot before use. Mix up our Wood Cleaner solution in a quart jar with a tight lid. Give it a good shake and rub it onto the wood paneling with a clean cloth. Let the solution work in for a few minutes then buff it dry with a dry cloth. It removes built-up grime and gives the wood a new shine. Regular polishing keeps your wood furniture looking good and dust free, but over time polish builds up on the surface and can cast a yellow tint. Remove the excess polish and prevent future build-up by cleaning your wood furniture occasionally with a mixture of half water and half white vinegar. Dip a cloth into the mixture and squeeze it dry. Clean the furniture, moving with the grain, then wipe it dry with a soft towel. The odor neutralizing properties of vinegar work equally well on smoke and food odors. If you’ve recently had smokers in the house, or you had a smoky accident in the kitchen, get rid of that lingering odor with vinegar. This tip also works when cooking fish, cabbage, and other strong smelling foods. Place a shallow bowl of vinegar in the room where the smell lingers. For serious odors, give the air in the room a quick misting of vinegar. The odors should be gone within a day, but repeat it if needed. Another method that works quickly in the kitchen is to put a cup of water and 1/2 cup of white vinegar in a pot and bring it to a boil. Let it simmer on the stove until almost all of the liquid has evaporated. Your kitchen may smell of vinegar for a while, but it will remove the objectionable odors. There is no need to buy expensive stainless steel clean products for your appliances. I simply give mine a quick spray of undiluted white vinegar and buff them to a shine. I clean up greasy spots in the kitchen with a quick spritz of my All-purpose kitchen degreaser and a wipe up with a sponge. There is no need to rinse. This degreaser works for grease on the stove, kitchen table, to clean countertops, and the backsplash. However, be warned not to use white vinegar to clean granite or quartz based natural stones. Remove greasy residues from your kitchenware by adding 1 cup of vinegar to the pot and filling it with hot water. Bring the pot to a simmer over low heat and let it simmer for 10 minutes. Pour off the vinegar and water and dry the pot. Sometimes lunch boxes and plastic containers absorb odors, no matter how clean they are. I have learned to deodorize them with a slice of white bread soaked in white vinegar. Place the bread in the lunchbox overnight. The container will be odor free by the next morning. To get a thermos or water bottle clean and get rid of any musty odors, use my Bottle Cleaner trick. The rice rubs the inside of the bottle clean, including any small cracks and crevices, getting it clean and odor free. Put the mixture in the bottle or thermos, screw on the lid and give it a good shake. Then empty it, rinse it out, and let it dry. I am very picky about how we clean the cutting boards. I want them cleaned and sanitized, so here is what we do. We wash the boards front and back with hot soapy water, rinse them, and dry. Then I sanitize them with our maximum strength natural sanitizer. You need to mix this solution and use it immediately because it loses its strength over time. I learned this cleaner recipe from a professional chef who uses it in his kitchen. He says that this combination of natural ingredients is even more potent than bleach, and it is food safe. Dip a sponge or cloth into the solution and spread it on the cutting board. Let it sit for 5 minutes, then flip the board and do the other side. Clean Your silver jewelry, tableware, and other silver pieces with a dip in my Silver Cleaner. Leave them to soak for two to three hours, then rinse and buff them to a shine with a soft, dry cloth. This homemade silver cleaner will save you time, elbow grease, and money compared to commercial silver cleaners. Best of all, it will not scratch your silver or damage it in any way. Shine up your brass and copper utensils with our salt and vinegar metal cleaner. This homemade brass polish is an easy-to-make paste. Just rub the item with the paste until the tarnish is gone. For items with a thick coat of tarnish like a penny or coins, cover the item and paste with plastic wrap and let it work for a few hours. Rinse with cold water and buff it to a shine with a soft towel. To use white vinegar for cleaning non-tarnishing metals check out our polishing pewter tips and the DIY copper cleaner recipes. You don’t need expensive drying products in your dishwasher to make your dishes sparkle. Just put 1/4 cup of white vinegar into your dishwasher’s final rinse. It removes water spots and rinses away all the soap residue. Over time my teakettle develops mineral deposits in the bottom of the kettle. It doesn’t take long because I live in a hard water area. I clean my teakettle every month or two by boiling 3 cups of white vinegar in the kettle, then letting it sit overnight. The minerals are mostly dissolved by morning, and I rinse it out, giving it a little brush if needed when the mineral build up is thick. Be sure to rinse it well because vinegar doesn’t make a good cup of tea. The can opener is another appliance that I obsess about a little. I want it very clean and germ-free. After all, it is touching my food. My husband tends to open a can and walk away, He never thinks about cleaning the can opener when he uses it. Well, I have come up with a good way to keep it clean and sanitized. This method is for my electric can opener, but it works equally well on hand models. I spray the cutting wheel with a good portion of full-strength vinegar, then turn on the can opener. Next, I brush it with an old toothbrush as the wheel turns. This gets vinegar into all of the cracks and crevices. I do this nightly when I clean up after dinner. Now I feel more confident about the cleanliness of the appliance. I also wipe the sides of the appliance down with vinegar. Add ¼ cup of white vinegar to the fabric softener dispenser on your washing machine. It will automatically dispense the vinegar during the rinse cycle, leaving you with soft, clean clothes. We hope we have convinced you that white vinegar is a must for cleaning around your house. I buy the gallon size and use it for almost every cleaning task. The only warnings that I have run into are that you cannot use it on some natural stone products like marble. It will interact with the marble and cause pitting. If you have other uses for white vinegar that we missed, please let me know. We try to be complete, but everyone has different living situations, and some of you probably have uses that I have never thought of. Also, if you enjoyed this article and found it useful, please share it on your favorite social media so that others can benefit.